Just read this. Great book that never lets me down. Definitely one of the best DC books out right now. I’ve been really enjoying this Green Lantern series, its got such an epic scale. Agreed, its one of DC’s best Rebirth books. Your post prompted me to do an online search on what, exactly, is the Green Lantern? I didn’t realize there was more than one Green Lantern, and was unaware of the original guy, Alan Scott. Now that I’ve looked this up, the Green Lantern sounds really interesting! Thanks for expanding my horizons again. Glad you’ve been enjoying HJ&GLC Paul, have you checked out Green Lanterns? That’s pretty good also. It’s cool that you’re a big Kyle fan, I find him really underrated among the Lanterns. It’s a shame that he hasn’t gotten to appear in animation all that much. Hal’s still my favorite, but Kyle is a close second and he’s always seemed like he had the potential to be the strongest since he’s wielded all of the rings several times in the past. Seems like a pretty intense issue for sure! 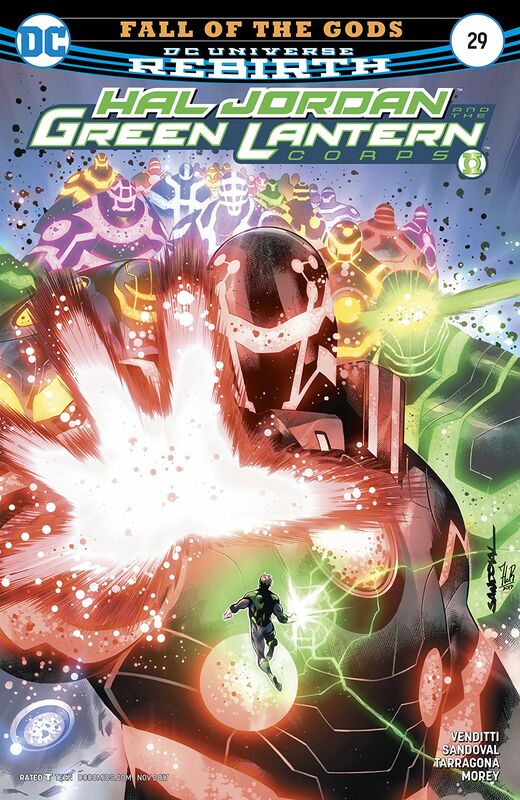 I really liked this cover as well, really captures the intergalactic scale of the threat the Green Lantern Corps face in this issue, beautiful colors as well!